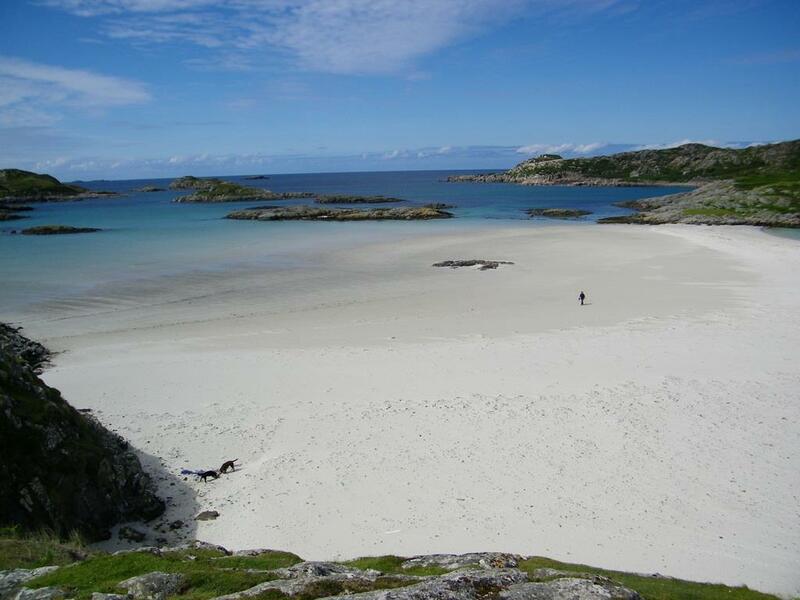 Fionnphort which means "Port of the White Sands" in Gaelic and is pronounced something like "finnyfirt" is on the south west peninsular of Mull,known as the Ross of Mull. (Ross is the Scottish word for peninsular). 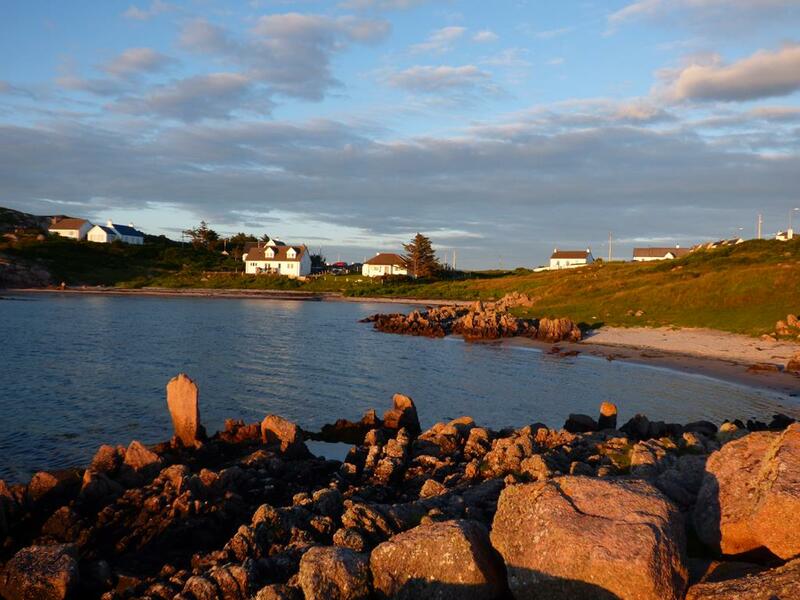 Fionnphort takes its name from the splendid white sandy bay which is overlooked by Seaview providing a wonderful foreground to the Isle of Iona and its many splendid sunsets. Many of our guests comment on the views we have from Seaview and they often tell us that by staying with us they have the best of both worlds-not least our welcoming hospitality but also the amazing views they have of the Sound of Iona and the Abbey,whilst enjoying breakfast and dinner. 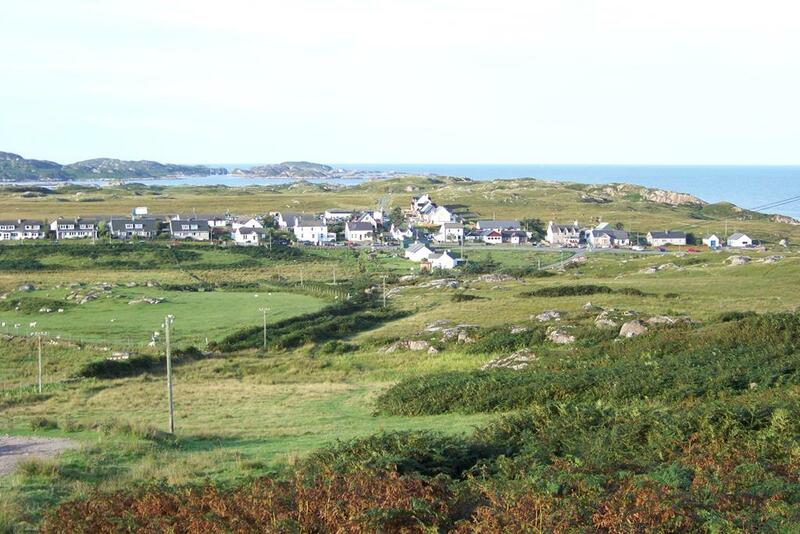 We agree with them-as inviting Iona is, the view from Iona back across the water to Fionnphort isn t quite the same! – it is also the home and workplace to approximately 100 people. 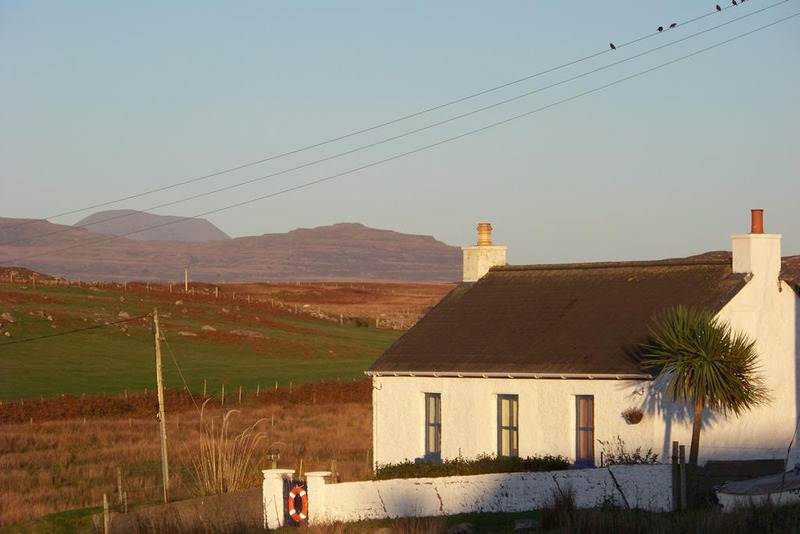 With only 45 homes in the village, Fionnphort and her residents support an astonishing number of visitors from around the world who travel through Glen More from Craignure to the Ross of Mull, whatever the weather 365 days a year. 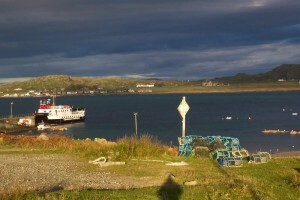 The land and coastal waters around the Ross of Mull, (including other out lying villages and communities) supports the traditional farming, crofting, fishing (lobsters, crabs and prawns), fish farms (salmon), ferry service and forestry industries as well as the important industries of tourism, hospitality, service and retail which are so vital to the local economy. 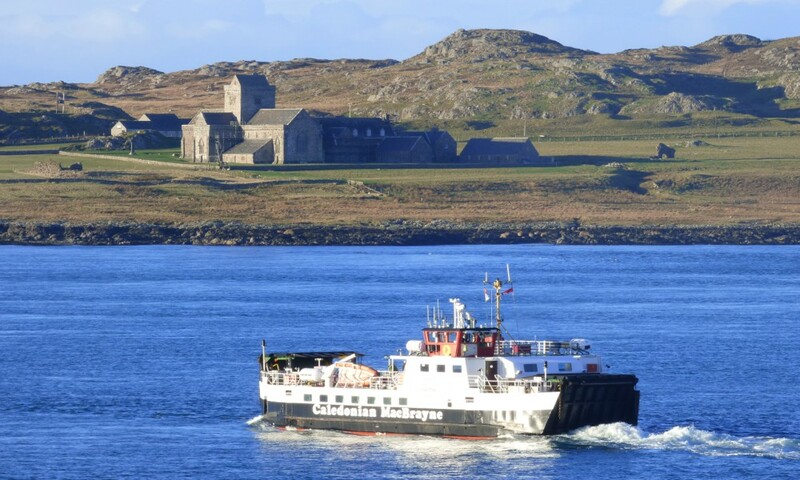 For Mull and Isles of Iona and Staffa, Fionnphort's position as the nearest and only ferry port for the Island of Iona and its historic Abbey is of vital importance to locals and tourists alike. The road stops here for cars and buses . 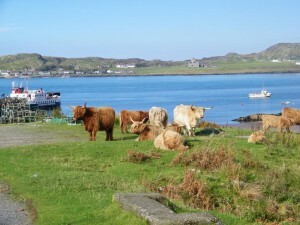 Tourists cannot take their car to Iona and therefore Seaview bed and breakfast is an ideal place to stay whilst visiting the area and you can park your car safely on our free car park at the front of our house while taking a ferry to Iona, Staffa or the Treshnish Isles : Seaview is only two minutes from the pier and ferry boats. 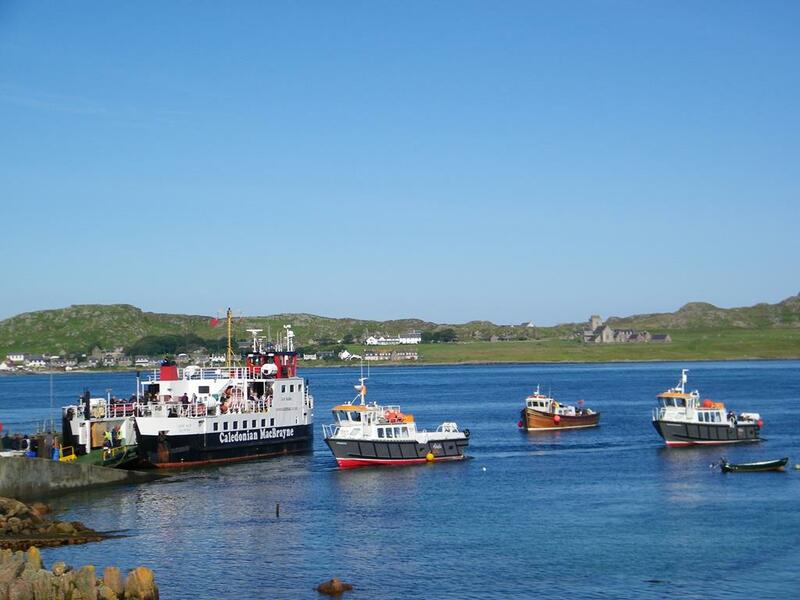 The pier is a busy focal point in the summer with the"Loch Buie" Iona ferry fishing boats and tour boats all berthing at the small jetty to carry on their business. 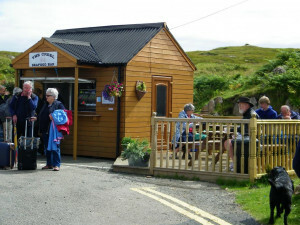 At the pier there are two eating places a good snack bar serving sandwiches,hot snacks, teas, coffees and home baking and waiting room with all facilities, there is also a Fresh Seafood Bar called the Creel which is owned by a local fishing family providing fabulous varied fresh seafood and great fish and chips. The fishermen land catches of crabs and lobsters at various times during the week at the pier and will sell you fresh crab or lobster. This is a interesting attraction as you are passing to Iona or Staffa and a great opportunity to sample the local produce. 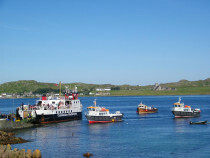 The views of Iona its historic Abbey and the ferry boats while your eating your crab sandwiches are splendid, You can eat inside at the snack bar and outside at tables at the Creel. Had the writer stopped to find out, he or she would have discovered for themselves! 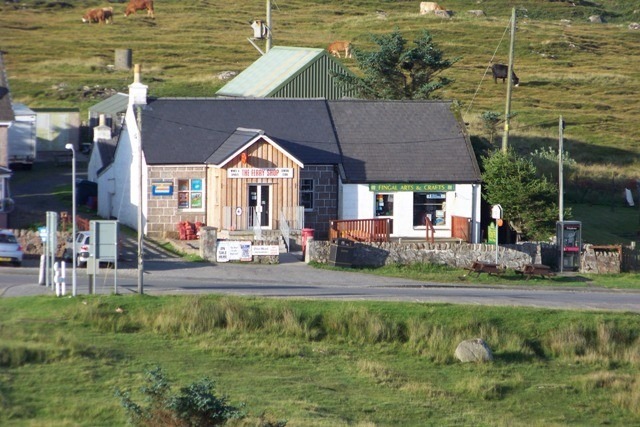 Recent guests of ours commented on the tourist information book referred to above, and told us that she had read the guide and in her view the comments were wrong and the authors clearly hadn't stayed, that in fact Fionnphort was a gem of a place and well worth stopping for; not just to observe a real Hebridean community at work and at play but a rare opportunity to join in with the island life and sample the warm and friendly hospitality on offer and a unique and memorable experience to take home with them. One can’t receive a better accolade than that. 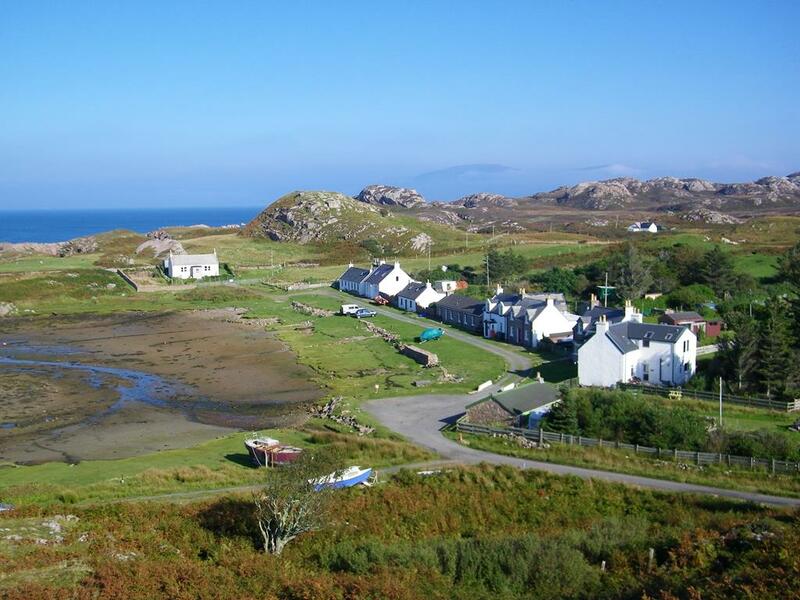 Enjoy the splendid views from the Creel seafood bar to Fionnphort Bay, the Sound of Iona and Isle of Iona and its historic Abbey, whilst savouring the tastes of the sea. 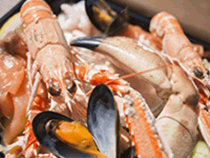 Spend time at the Creel enjoying the fabulous seafood flavours from the surrounding waters of Mull and Iona. A family run takeaway seafood bar serving local Mull freshly caught seafood at Fionnphort Pier most days in the summer months. Oysters hand picked from Dervaig, scallops from Tobermory fishermen, and crab and lobsters caught by the owner Alex husband fisherman Andrew. Sit on the pleasant decking area , relax and soak in the laid back island lifestyle. 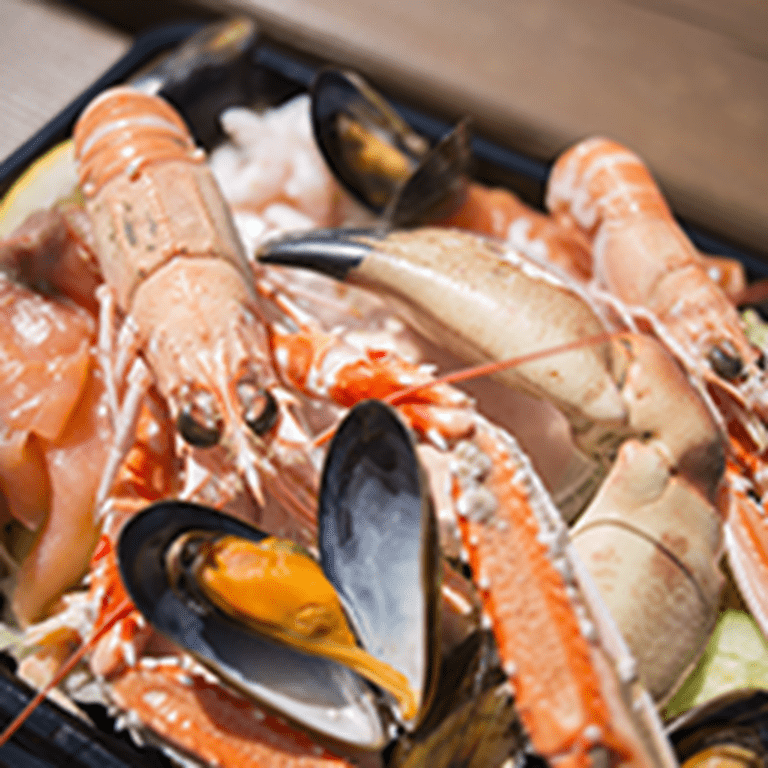 At the Creel seafood bar they appreciate and value the efforts of those involved in the Scottish fishing industry, as fishing has been in the family for generations. 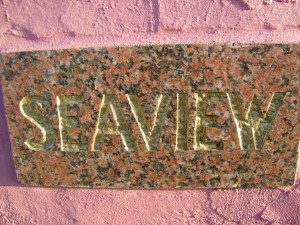 So come and try the fruits of the ocean at the Creel. 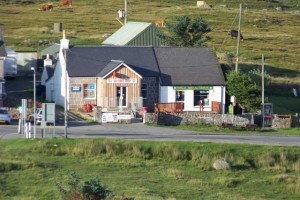 The Keel Row Pub & Restaurant is a traditional Hebridean crofters cottage which has been converted into a pub and is owned and run by Marilyn & Brendan along with their staff. 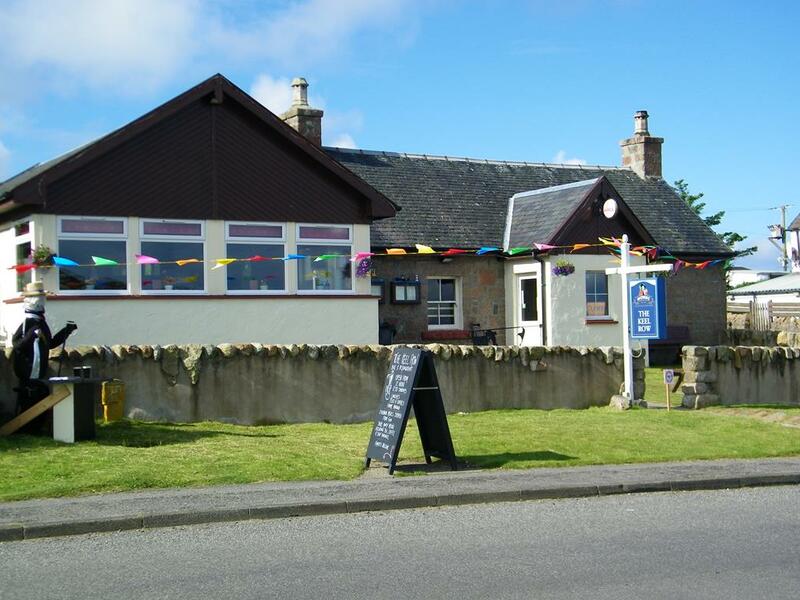 The Keel Row offers a warm and inviting welcome to everyone and is family and dog friendly offering a wide and comprehensive menu catering for most tastes and budgets. 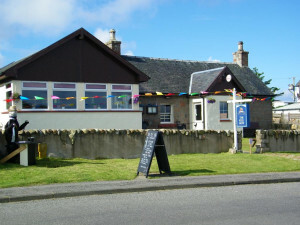 The pub is open at lunch time for soups and sandwiches and serves evening meals from 6 pm in the restaurant. Reservations cannot be made as a 'first come-first served' system is operated. Food is plentiful and outdoor seating offers the opportunity to watch some spectacular sunsets whilst enjoying a wee dram or two; alternatively a wood burning stove sits tucked away in the fireplace in the pub giving off a cosy heat for those chillier evenings and days. HM Coastguard provides an important role in the community – the building can be found on the left on the way down to the pier. Coastguard callouts for search & rescue teams and medivac operations are all facilitated by local residents who volunteer their services even though they are busy with their businesses and work. The team at Fionnphort are called out several times a year to assist in a number of emergency callouts in all weather. 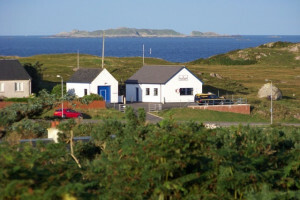 Other facilities in the village include the Calmac ticket office for the ferry across to Iona, and the ferry terminal with a tea room as well as public toilet facilities. 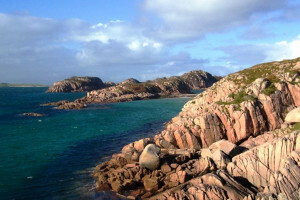 Along with the many white sandy beaches, coves and bays offering visitors hours of beachcombing and discovery, the surrounding area has bird life galore, flora and fauna, walks for the uninitiated and the more experienced, and stunning views and scenery waiting to capture your heart and hopefully some amazing photographs too. The folks back home just won’t believe the beauty of the place. Marine life is also abundant – Sammy the seal can often be seen in the bay especially when the fishing boats are in and landing their catch of lobsters, crabs and fish. 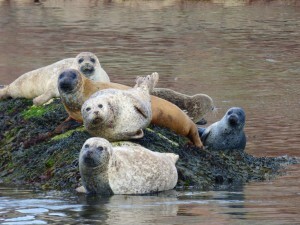 Hand fed by the fisherman, Sammy sometimes appears with another seal but we don’t know if he’s a pal or a girlfriend. We are still waiting for a baby Sammy. Dolphins, porpoise and basking sharks have all been seen in the waters around Fionnphort swimming up and down the Sound of Iona; line fishing for crab and mackerel are enjoyed by youngsters (old and young) on the pier – freshly caught mackerel grilled on the BBQ on the beach is something else. 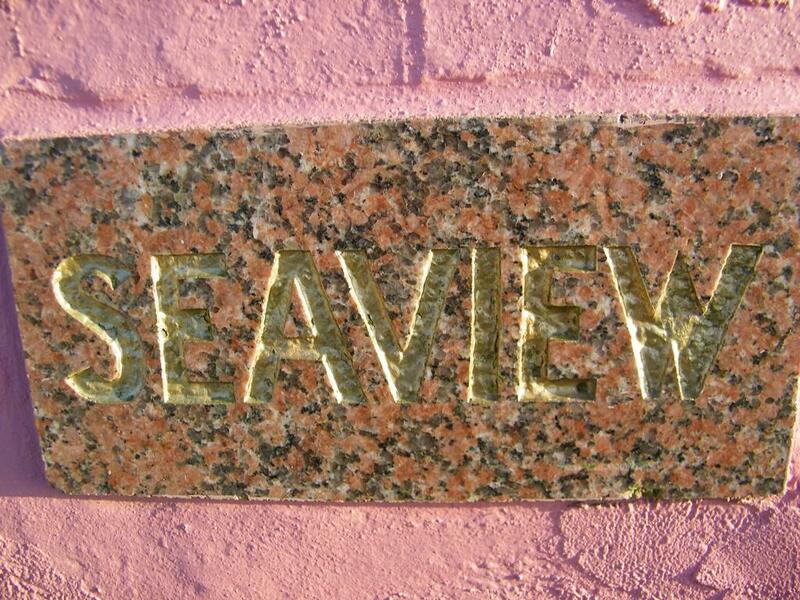 Here at Seaview we work on ‘Mull’ time – the pace of life is a lot slower and much more relaxed. When we are asked what time it is – we often say with tongue in cheek ‘light o’clock’, ‘dark o’clock’, ‘eat o’clock’ or ‘sleep o’clock’– time isn’t really that important to us and we try to enjoy each moment each day. If we are asked what day it is, we say “We don’t know but it ends in the letter ‘y’”. We aren’t being cheeky when we say this, we just believe that there are other choices to how one can live their life and we choose to prioritise ‘differently’ to some other folk. It may sound quirky but it suits us and our guests appreciate our approach as it helps them to relax, unwind and enjoy their time on the island – and very often when checking out, guests discover they have ‘lost’ a day or two! Distinctive Fingals Rock Fionnphort Bay winter sun on it! recognisable landmarks is the huge split rock on the beach - it's very impressive and can't be missed. Legend has it that Finn McCool (Fionn mac Cumhail) an Irish Giant lived on an Antrim headland and one day when going about his daily business a Scottish Giant named Fingal began to shout insults and hurl abuse from across the channel. In anger Finn lifted a clod of earth and threw it at the giant as a challenge, the earth landed in the sea. 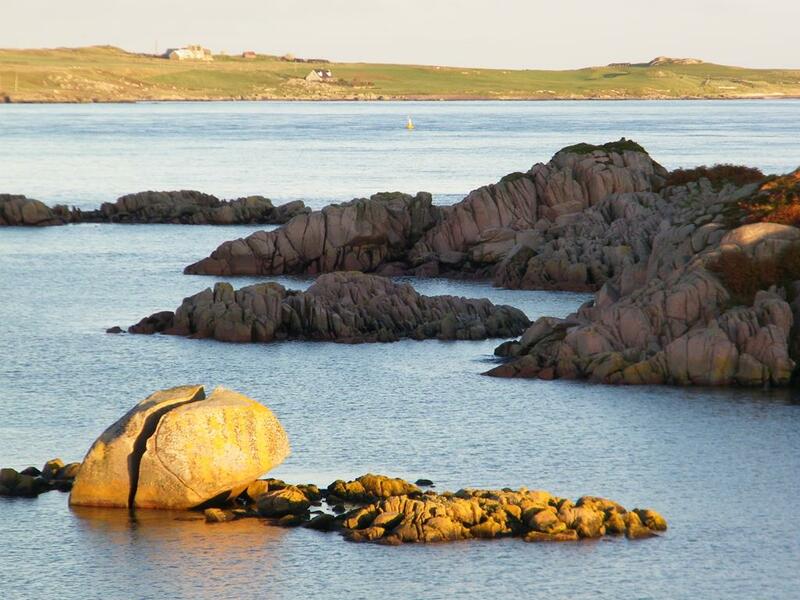 Fingal retaliated with a rock thrown back at Finn and shouted that Finn was lucky that he wasn't a strong swimmer or he would have made sure he could never fight again. Finn was enraged and began lifting huge clumps of earth from the shore, throwing them so as to make a pathway for the Scottish giant to come and face him. However by the time he finished making the crossing he had not slept for a week and so instead devised a cunning plan to fool the Scot. Finn disguised himself as a baby in a cot and when his adversary came to face him Finn's wife told the Giant that Finn was away but showed him his son sleeping in the cradle. The Scottish giant became apprehensive, for if the son was so huge, what size would the father be? In his haste to escape Fingal sped back along the causeway Finn had built, tearing it up as he went. He is said to have fled to a cave on Staffa page read more which is to this day named 'Fingal's Cave'. 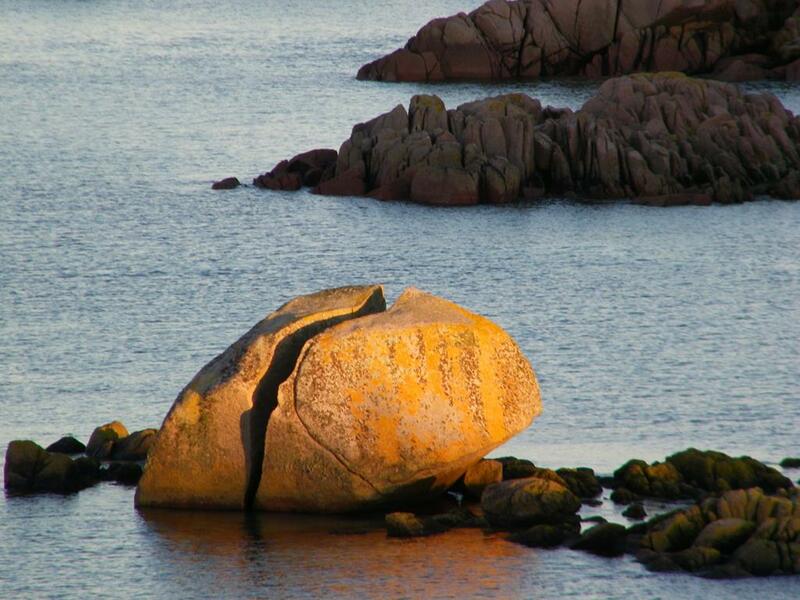 'Local legend' has it that the boulder on Fionnphort beach is one of the stones thrown in the heated exchanges between the two giants and this is where one of them landed! The most dominant feature of the lower end of the Ross of Mull is its red and pink, rounded granite landscape. 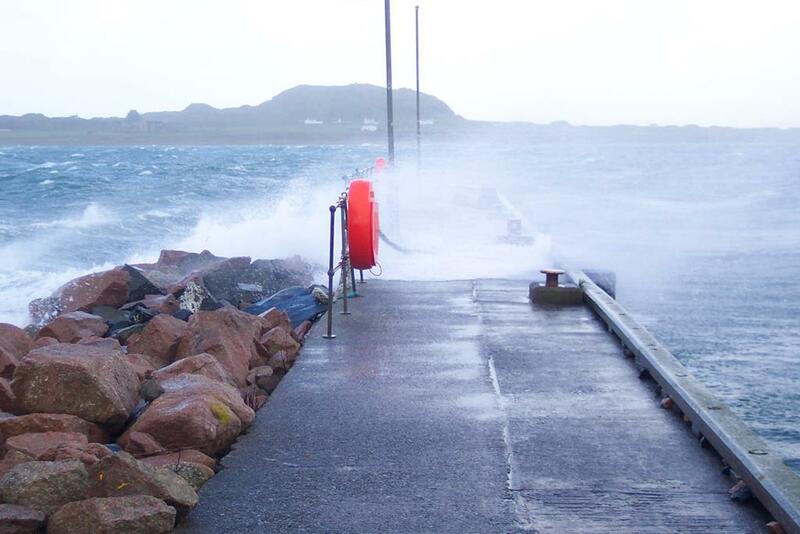 The area starts just to the west of Bunessan and finishes out at sea as the Torran rocks. 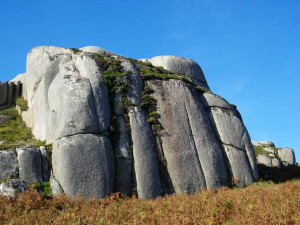 The attractive colouring of the rock and its tough qualities have been recognized by man since early times and its exploitation as a decorative, durable building material, was inevitable. 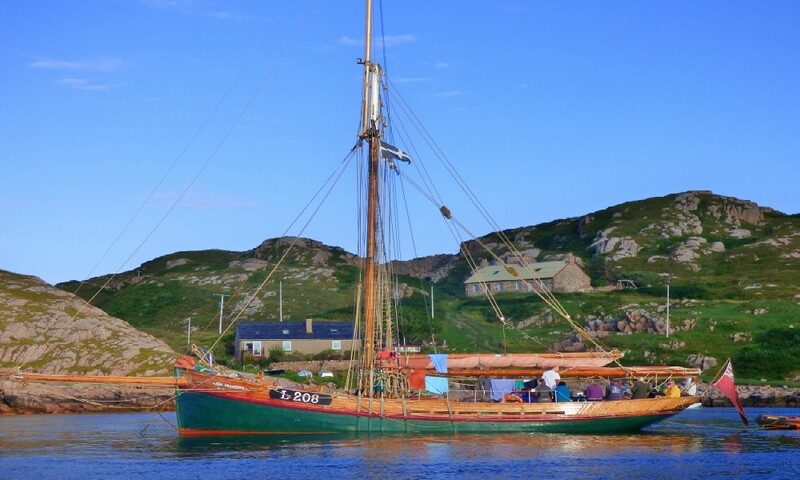 On the Ross of Mull several economic factors came together to make commercial quarrying a reality. Firstly, the rock is extensive and of a particularly high, attractive quality. Secondly, it was in close proximity to several large civil engineering projects like the lighthouses, and in earlier times Iona Abbey and its monastery. Finally, the most important economic factor of all was its close proximity to the sea and transport. 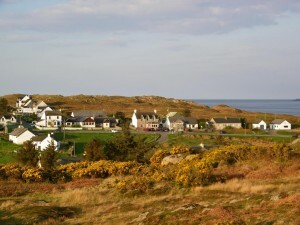 Tormore Quarry fulfills all the factors required for economic extraction and was used for many years to decorate and construct many famous buildings. To go into the full history of Tormore Quarry would be too extensive to reproduce on an introductory webpage, and, so I would strongly recommend that if you wish to read more about this subject that you buy the definitive book by Joan Faithfull entitled "The Ross of Mull Granite Quarries" published by The New Iona Press ISBN 0 9516283 6 4 This book is available for purchase in the book section of The Ferry Shop next to Seaview. The author has a cottage in the Tormore quarry and her family visit in the Summer. Anyway, a quick history in brief. Opened in 1831 for commercial extraction and quarrying ceased in 1910. 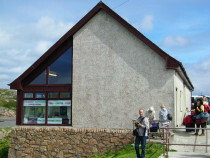 Reopened by "Scottish Natural Stones" in 1985. Stone is only rarely extracted now. 1990 was the last really busy period when I used to see lorry load after lorry load of large unshaped Granite blocks leaving the island on the back of articulated wagons. Cranes and quarry equipment lies derelict in the working area today 2007). The stone that was produced was shipped to many places in the world, particularly America. 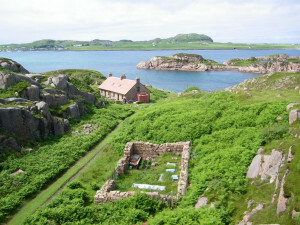 Its use for monumental construction has meant that pieces of Ross of Mull Granite have turned up as far away as China, and in graveyards throughout the world. The list of some of the more well known structures is shown below. 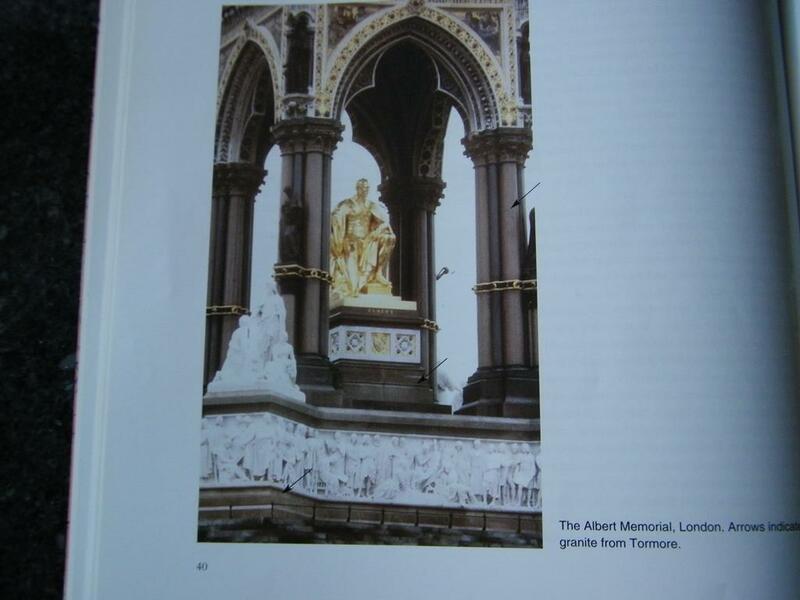 It has been compiled from Joan Faithfull's book and "Scottish monumental stone's" catalogue. Some of the structures were made from Granite from other local quarries in combination. Iona Abbey; Columns for the Glasgow General post office and University; Dunrobin Castle, Golspie; Manchester Town Hall; St.George's Hall, Liverpool; Argyll car factory in Alexandria and more recently the Halifax Building Society in Kilmarnock; Compaq Computer Facility in Erskine; Sun Alliance Offices in Edinburgh and the High Commissioner's House in Wellington, New Zealand (foyer and lift area). 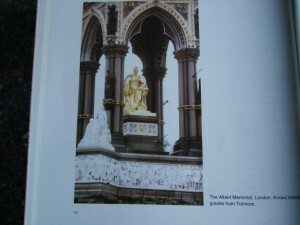 The Albert Memorial in Kensington Gardens; Royal Mausoleum, Frogmore, London; Eric Liddell Memorial in China; the Skerryvore, Ardnamurchan, Dhu Hartach and Hyskeir Lighthouses; Blackfriars, Westminster, and Holburn Viaduct bridges in London; Jamaica and Kirklee bridges in Glasgow; New York, Liverpool, Birkenhead, Barrow, docks and numerous piers. For the complete list then have a look at Joan Faithfull's book - it really is worthwhile. 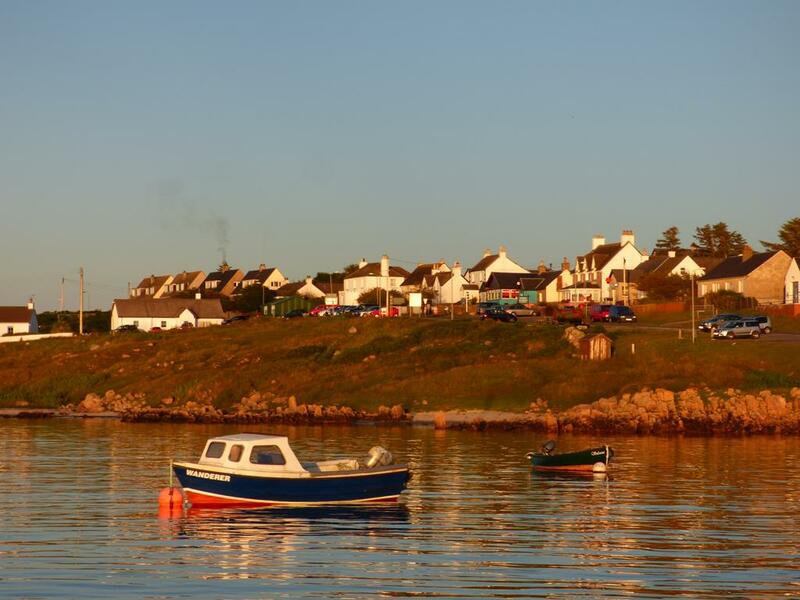 Although Fionnphort is the main village at the end of the Ross, there are a number of smaller settlements close by including Kintra, Creich, Fidden, Pottie, Knockvologan and the Isle of Erraid all of which are accessible on foot/cycle. About one and a half miles outside Fionnphort from the main Fionnphort-Bunessan road, turn left at the 'T' junction; you will see the war memorial and Creich Hall. 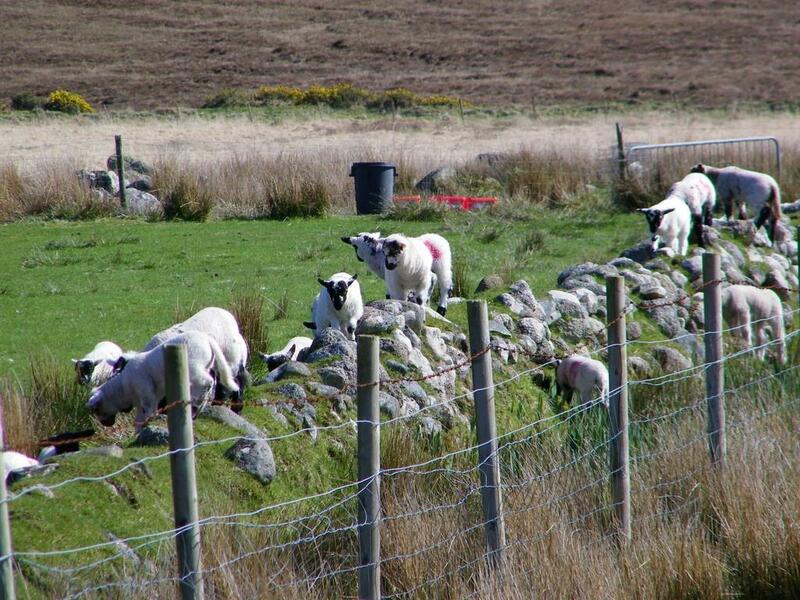 Follow the road to the end for approximately 2 miles, and down the wee hill lies Kintra. There is a small parking area at the end of the road; the track along the front of the houses is private. There is a nice short walk from the north end of the village to the north west tip of the Ross of Mull where there are 2 little hillocks; climbing to the top of them you have lovely panoramic views of the north end of Iona, Treshnish Isles group i e Dutchmans Cap, Lunga, Fladda and Carn Na Burg also Staffa and The Ardmeanach Peninsular or Burg as its known locally. 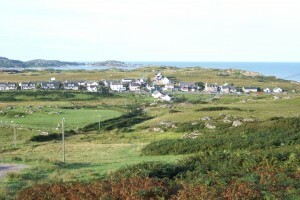 Tiree and Coll can also be seen from here when the visibility is good. In mid to late summer terns and artic terns can be seen just offshore here, a spectacular display of diving into the sea catching fish. Just before entering Kintra there is a lane to the right which takes you to Rosie s wonderful market garden croft at Inver. There is a nice little shop there supplying seasonal vegetables, farm eggs, Jacob sheep lamb, home baking and preserves all from the croft. You will also find many eco friendly products. 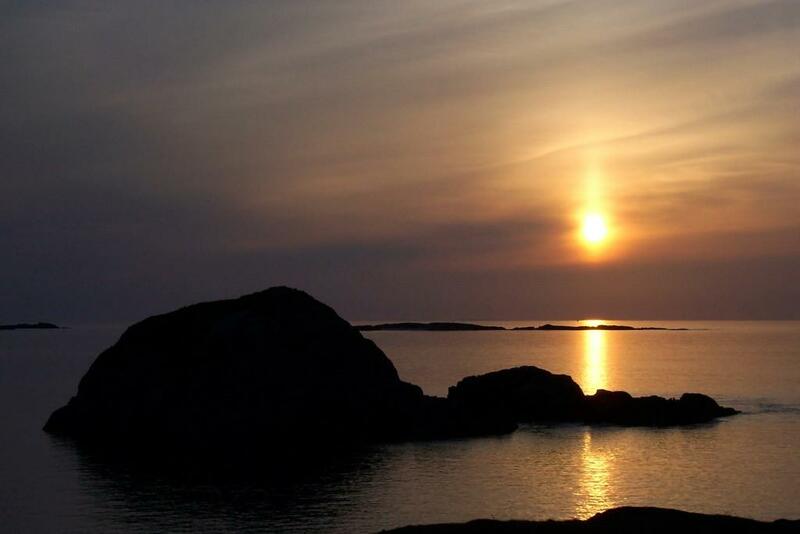 In the summer evenings Kintra to the west you can experience fabulous sunsets over Iona. Fidden can be found about one mile south along the road from Fionnphort, turning left at the junction in the village before you reach The Keel Row pub. 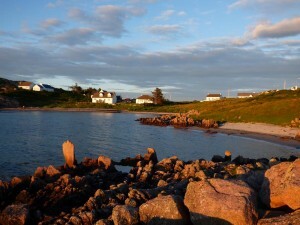 The road is single track and winds and twists along the coast giving you access to a number of small sandy beaches which form part of the farm at Fidden. The land is farmed by Jimmy & Christine Campbell who keep sheep and a small number of cows all of which roam free on the land as well as along the road and on the verges. 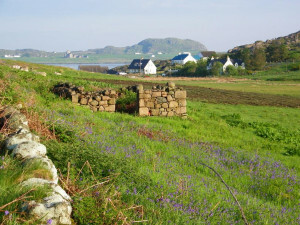 The road runs through the farmyard where the old farmhouse is situated and continues on towards Knockvologan. Fidden campsite is part of the farm and is also run by Jimmy. It is very popular during the summer months by campers with tents, caravans and tourers. 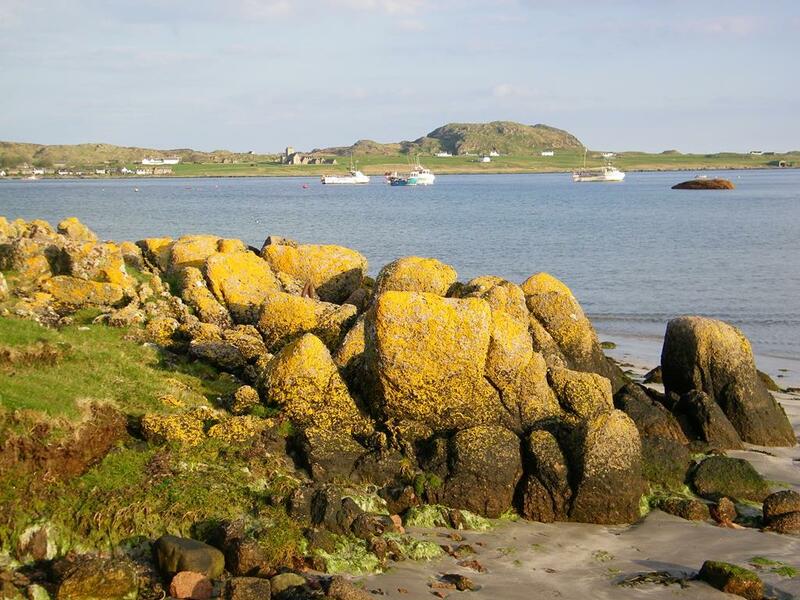 The beaches are beautiful and the setting absolutely stunning with views across the sound to Iona and is close to Erraid We walk this land daily with our dogs Megan & Lainie in amongst the sandy coves, across the moors and over the up the hills. 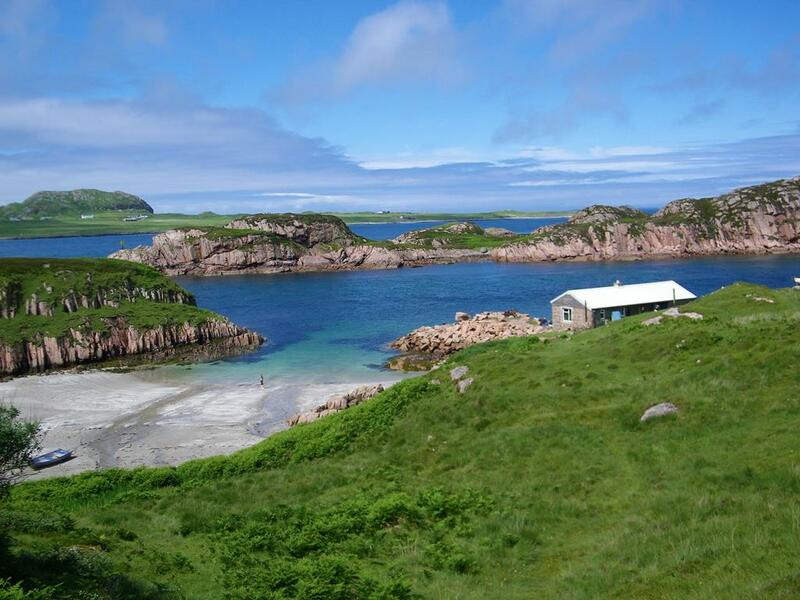 Bird and wild life is prolific along this stretch of coast line with several varieties of waders and ducks, along with geese, oystercatchers, lapwing, mountain hare, buzzards, hen harrier and even white tailed eagles have been spotted hunting here. 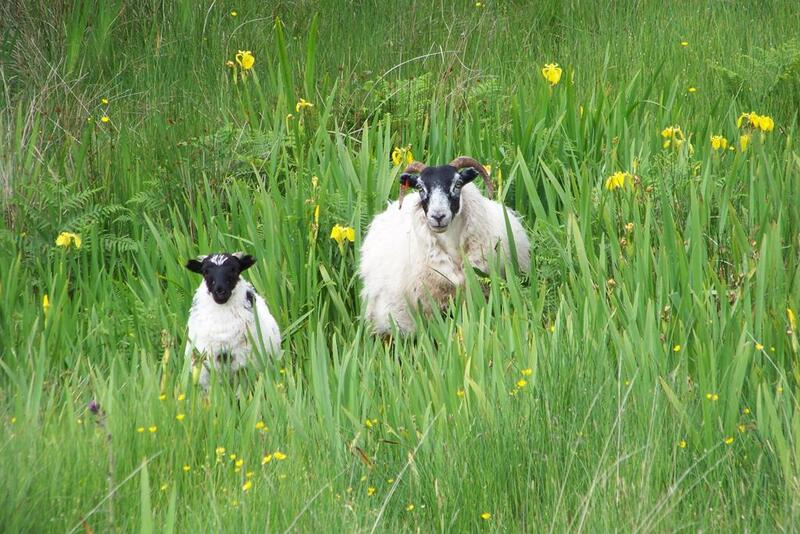 The wild flowers including orchids are abundant from April onwards right throughout the summer and can easily be seen in the ditches on both sides of the road. Knockvologan If you carry on following the road through Fidden farm for a further 1.5 miles, you'll zig zag your way round hairpin bends and up a small hill before you finally reach the farm gate to Knockvologan. If you are walking or cycling, carry on through the gate (remember to leave the gate as you find it), up the hill and round towards the farmhouse. The tarmac road eventually runs out and continues as a dirt track down the hill towards the lovely sandy white beaches. 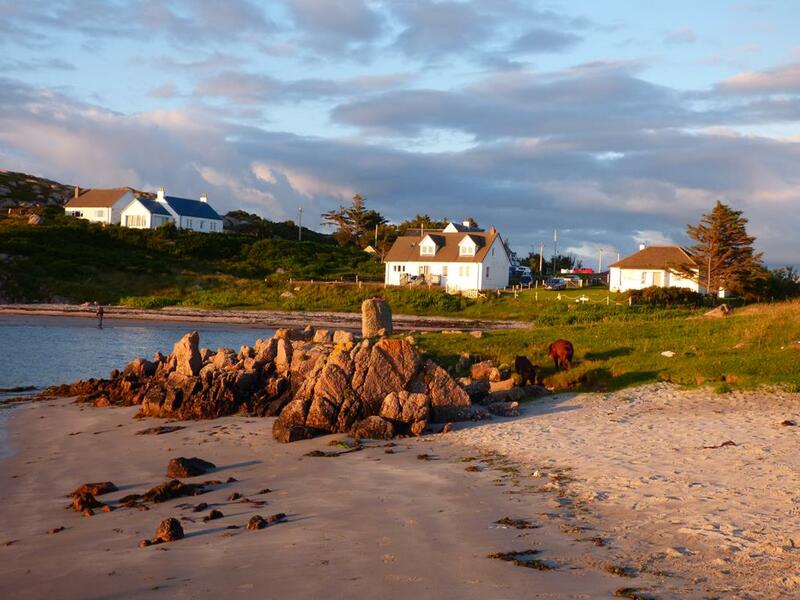 Spend time exploring the beaches or make your way round to the right; if the tide is out you can walk along the beach that connects Erraid with Knockvologan and round on to the isle of Erraid itself. 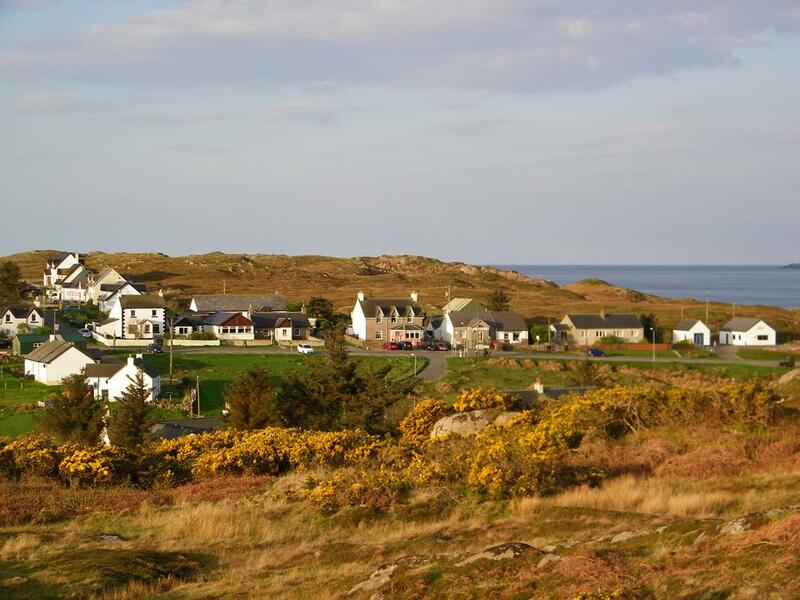 If you have driven up from Fionnphort then the best place to leave your car is on the grassy verge on the left, off the road about 200 metres from the gate, before you reach the white bungalow on your left. This is a car parking area and is also used for walkers hiking the Tireagan trail to Traigh Ghael beach which is without doubt well worth the trek (about 5.9 miles return) which can be arduous at times across boggy moorland, up hills and down through undergrowth from the cliff tops to the beach below. foot or by boat. Some have tried mountain bikes but it isn't suitable terrain for bikes. This is one of our favourite walks in the summer - both Megan and Lainie love it too as they get to have a swim in the sea at the end.